I love life and enjoy it to the max, especially getting out and about, writing, taking zany art photos and playing my mandolin. 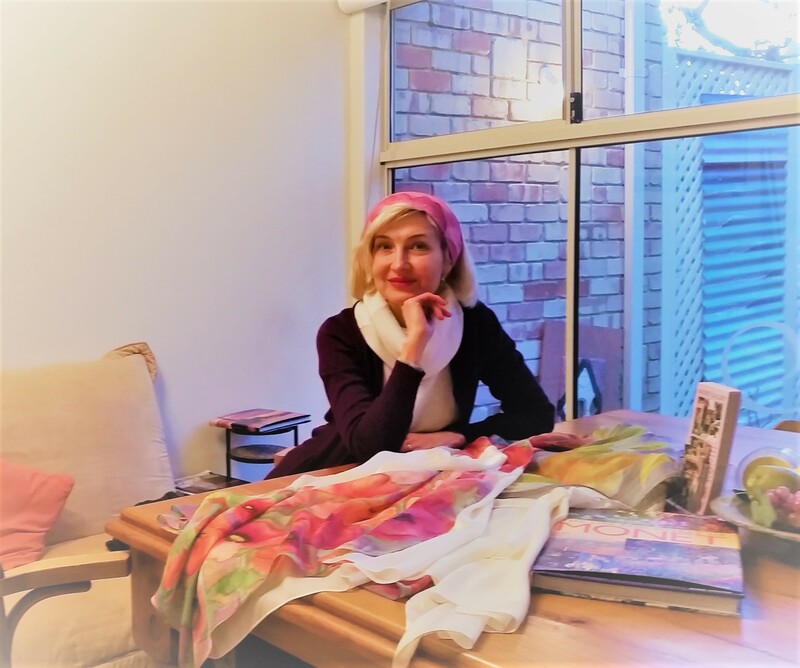 With some springtime weather around the corner why not explore the wonderful world of Silk Art with artist Natalie Malarowski who now has two time slots for Beginner Classes starting soon at 18 Ferguson Street, Maylands. A day time Beginner Class, a 4-week course, will start on Friday, September 22nd 2017 from 10.00 am to 1.00 pm and run weekly until Friday, 13th October. Due to popular demand there will also be an evening course of 4 lessons of Beginner Classes for those who are unable to make day time classes starting on Wednesday 20th September from 6.30pm to 9.30pm and will run weekly until Wednesday,11th October. The cost of the courses is $33 per 3 hour lesson, $132 payable at the first session. Cost includes the fabric to make three scarves, one small square and two other larger squares using varying techniques plus paint, brushes, resist, applicator and the use of a stretching frame to ensure the silk is correct tension to apply the acrylic paint. 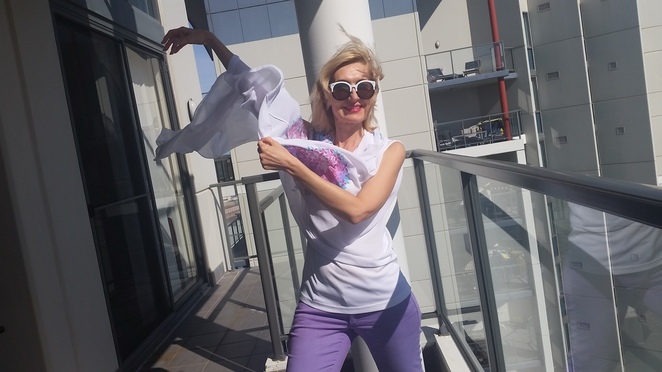 Natalie runs beginner classes and more advanced classes at various times during the year so contact her by email on nataliemalarowski@gmail.com to find out details of upcoming courses and workshops. 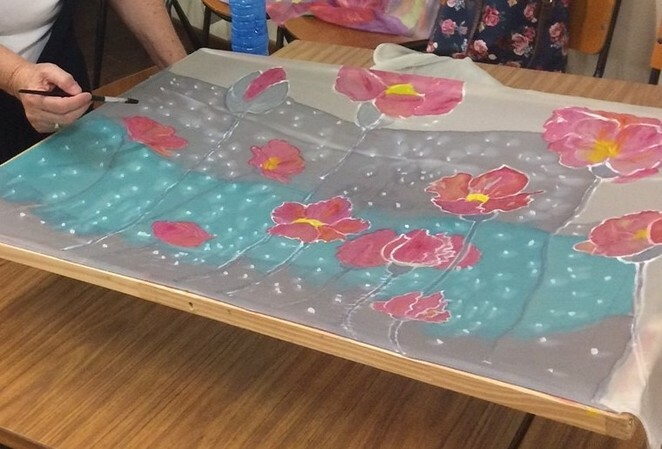 If you have ever wanted to unleash your creative energy and would like to try your hand at painting with acrylics on beautiful pure silk, design your own wearable art or craft a piece of art for your wall, then Natalie's classes are just the ticket. Natalie studied fine art in her home in Ukraine and has produced silk paintings, wall hangings, scarves, pashminas and clothing. Much of her work features Nordic myths, animals and beautiful flowers including her signature theme of poppies, the floral emblem of Ukraine. Natalie also explores patterns and abstract styles in her batik work and encourages a diversity of style in her students. Some of Natalie's work is often on display and is for sale at the Monet Gallery in South Guildford, a treasure trove for artists and lovers of art in all its forms. See my article about Monet Gallery here. Students in the silk painting class are taught free form expression, where acrylics are used in a similar fashion to the watercolour technique of wet-on-wet where colours blend and merge. As well, students are given the opportunity to explore the many styles and varieties of resist techniques where the shapes are outlined to result in discrete motifs without the unwanted "bleeding" that can occur. Natalie loves to share her skills with students and brings in dynamic fun ways to make the lessons both instructive and enjoyable. 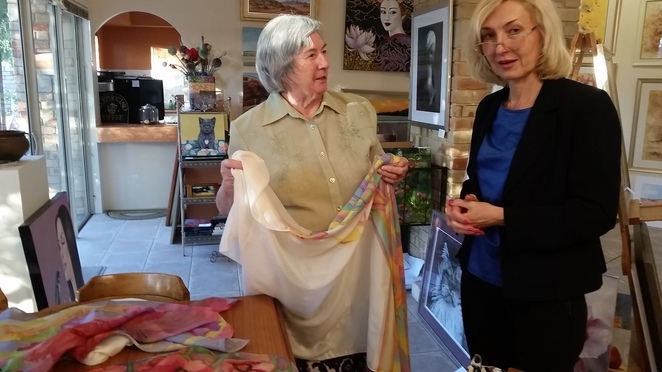 Generally the sessions seem like a friendship club as students support each other in the liberating process of creating the design and applying the colours to the silk. 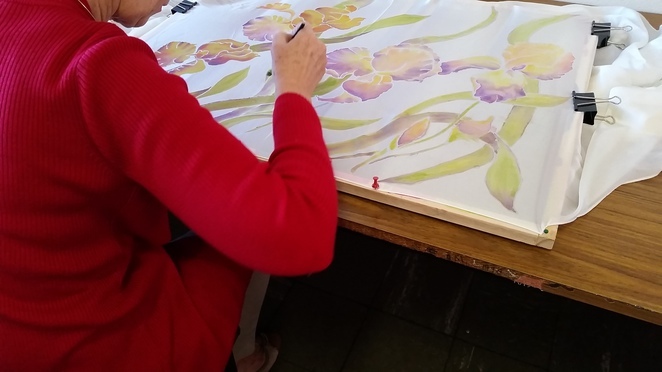 For many students it is their first time painting and it can be a bit daunting when committing the first brush strokes to the naked silk but Natalie gently gives them confidence, encouraging them to be brave and achieve their own style. Keep in touch with Natalie to find out more about different events, exhibitions, classes and workshops.